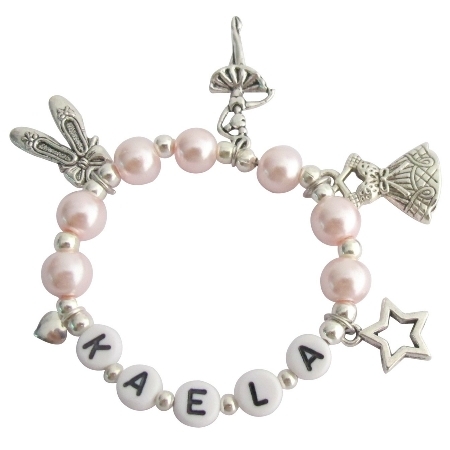 This is a beautiful ballet bracelet is made with Blush Pink glass pearls with silver beads & a multiple charms - ballet dancer / ballet dress / ballet shoe / star & heart charms complete ballet bracelet. You can personalized the name & bead color & bead type or ballet charm. Please note that children under 3 years of age should only wear this bracelet with adult supervision. This item in Bracelets & Bangles category was first added to our catalog on 11-05-2015. Buy Recital Gift Ballet Bracelet Blush Pink W/ Multiple Ballet Charms, sold & shipped by Fashion Jewelry For Everyone where you can shop online for Leading Online Retailer for Indian Fashion Jewelry. This Bracelets/Bangles collection has been tagged as ecital Gift,Recital Ballet,Recital Bracelet,Recital Blush,Recital Pink,Recital Multiple,Recital Charms,Gift Recital,Gift Ballet,Gift Bracelet,Gift Blush,Gift Pink,Gift Multiple,Gift Charms,Ballet Recital,Ballet Gift,Ballet Bracelet,Ballet .